Hi all! I wanted to share the exciting news: there's a brand new challenge mood board this month, thanks to International Scrapbook Garden. Join the ISBG Facebook Group if you haven’t already, create a layout/card/project using the mood board below, and post it to the folder in our Facebook group. 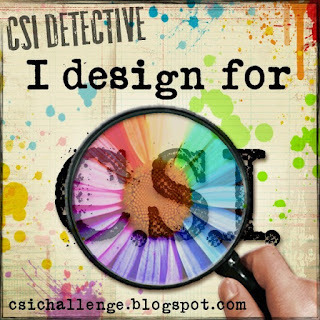 You are not required to use ISBG kits, but you will receive an extra entry if you do. A winner will be chosen at random on February 15th for a $25 credit in the ISBG store. 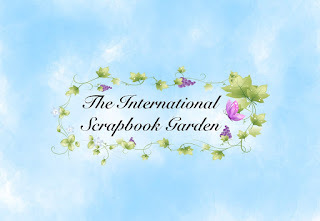 Check out these amazing kits from International Scrapbook Garden! First up is our January Garden Kit Reveal: Kisses and Snowflakes. I think you are gonna love this kit full of pretty pinks, purples, teals, and wintery grays! Both our kits this month have elements of wintery snow days mixed with Hearts and Love for upcoming Valentines. Kisses and Snowflakes features the new paper line Northern Lights from 7 Dots and Art Journey from 13 Arts. This kit is filled with embellishments including a Kaisercraft stamp for Valentines Day, some Prima Zella Teal Word Stickers, 7 Dots Die Cuts and Tags, Prills, Gems, Buttons, 2 chalk inks, beautiful coordinating flowers, ribbon and More! If you are a paper hoarder like me, we also have a Bonus Paper Kit available which coordinates nicely with the teals and grays in the main kit. If you haven't gotten your hands on the brand new BoBunny line Winter Playground, now is your chance with this bonus kit! Of course with all the extra paper, we need more embellishments. Well, we have those too with the Bonus Embellishment kit! And because you can never have too many flowers, we have an Extra Blooms bonus kit! Do you love chipboard as much as I do? If so, this next Bonus kit is just for you! And if you love to get your hands dirty, the Mixed Media Bonus kit is coordinated to perfectly match this kit and really add WOW to your layouts and projects. If you enjoy making cards and mini albums we have a kit for you too with the Fairy Garden Bonus Kit. Here you can grab almost all the paper in the main and bonus kits in a 6x6 size perfect for cards and mini projects. We also have an option to double the paper in the kits so you have the opportunity to use both sides, or you can buy just the kit paper here if you don't want to buy the whole kit. We have many purchase options and you can pick up just the kits that interest you! And remember, if you sign up as a subscriber you can save on your kits every month and reserve them so you won't miss any! Next up is our January Toolshed Kit Winter Adventures featuring the new paper line Denim and Friends from Maja Design. The Maja releases are always so big and expensive. Here we have them discounted in the kits, so this is your chance to grab the entire line for less between both the main kit and the Bonus paper kit! This paper line is full of pretty blues, browns, and teals and is great for generic layouts, but they can also be easily converted into wintery snowy layouts with just the right tools and embellishments. And valentines doesn't always have to be pink! So we have some hearts in this one too! This kit is packed with embellies as well including some real Jean material, a 6x6 template, Rustic Snow shovel, Fab Scraps and Creative Embellishments Chipboard, Wood slices, Resin Clocks, Jean Buttons, Tags, 2 Chalk Inks, and more! If you want to get your hands on the rest of this paper line, it is discounted here in the Bonus Paper kit. And we have a bonus embellishment kit for the Toolshed too! This kit includes elements to convert some of the blue papers into nice snowy, woodsy layouts, and if you need flowers, you can always find a few in this kit! This month the Bonus Chipboard Kit includes snowflakes and hearts, and also some more generic options for a little versatility. And what does chipboard sometimes need? Mixed Media! We have a great combination of tan, blue, and teal below and of course some much needed snowflake paste for those winter layouts! We also have a Fairy Garden Bonus kit available with the Toolshed kit for making more masculine cards, mini albums, and projects. This kit includes all the paper in both kits in 6x6 size! And lastly we have a Double It! option for all the paper in the Winter Adventure kit. So if you want to use both sides of your paper, or just get your hands on this very versatile line of Maja paper at a discount, now is your chance! I hope you will be inspired by the Mood board above and our kits to create something beautiful and amazing! Please join us this month in our first challenge for a chance to win a gift card to the store. And if you are looking for more inspiration, check back in a couple of days for some brand new layouts from the incredible design team using these new kits! Hope to see you soon in our Facebook group!